* SJ Lee and JH Yoon contributed equally to this paper. 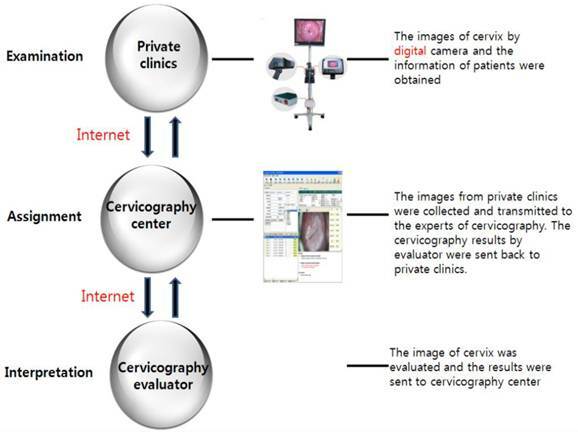 Objective: To evaluate the correlation tendency between abnormal findings of digital cervicography and cervical pathology at private clinics in Korea. Methods: Abnormal finding of digital cervicography performed at private clinics in Korea between January 1, 2010 and May 31, 2012 were analysed retrospectively. The patient's age, abnormal findings of digital cervicography, cervical cytology, human papillomaviru (HPV) test and cervical pathology were investigated and the rate of agreement between abnormal finding of digital cervicography and cervical pathology results was calculated. Abnormal findings of digital cervicography were divided into 4 categories: atypical, compatible with CIN1, compatible with CIN2/3 and compatible with cancer. Results: The study group was composed of 1547 women with a mean (range) age of 37.4 (14-91 years). The agreement rate between abnormal findings of digital cervicography and cervical pathology was 52.0% in “compatible with CIN1”, 78.9% in “compatible with CIN2/3”, and 90.2% in “compatible with cancer”. Conclusions: Abnormal findings of digital cervicography were highly concordant with cervical intraepithelial neoplasia (CIN) and cancer examined at outpatient clinics in Korea. Therefore, abnormal interpretations of digital cervicography can be used as an excellent auxiliary technique with cervical cytology for CIN and cancer. Cervical cancer is the second most common female malignancy worldwide , and human papillomavirus (HPV) is the main cause of the disease . Screening using the Papanicolaou (Pap) smear has very successfully decreased the incidence and prevalence of cervical cancer in developed countries . The evaluation of cervical cytology is usually regarded as the first step in screening for cervical cancer. Nevertheless, false negative rates as high as 58% are a notable weakness of Pap smear screening [4-6]. The main causes of false negative results are due to the sampling procedure, time interval between Pap smears, and interpretation of the observer . Alternative or adjunct tests, such as liquid-based cytology, an HPV DNA test, colposcopy, cervicography, visual inspection, and speculoscopy were introduced to overcome the shortcoming of the Pap smear . Colposcopy is the most appropriate procedure for evaluating the patients with abnormal cytology. It is also a very useful instrument for locating the exact sites of biopsy. Unfortunately, it is a very expensive instrument to set up every office. Successful colposcopy depends on the experience of the colposcopist . Cervicography was introduced to fix up the problems of colposcopy by Stafl in 1981 . Recently, digital cervicography adopted digital pictures instead of 35-mm sized slide and saved the cost and time for interpretation of abnormal cervix. In private Korean clinics, digital cervicography is popular instrument in the evaluation of women with abnormal cytology, where doctors have insufficient experience with colposcopy and want to utilize objective photography of the cervix to document the disease. A cervical biopsy had been also performed on patients presenting with abnormal cervicography, according to the recommendations published by expert colposcopists. However, there have been few comprehensive surveys of the concordance between abnormal findings of cervicography and results of cervical pathology in Korea. The aim of this study is to determine the agreement rate between abnormal findings of digital cervicography and histological diagnosis performed at private clinics in Korea. Cervical cytology had been performed on women attending the private clinics as part of screening program in Korea. Digital cervicography was executed on patients after abnormal cytology was initially diagnosed. The data was retrospectively collected from the records of women who were diagnosed with abnormal results on cervicography between January 1, 2010 and May 31, 2012. Patients with abnormal impression of cervicography underwent cervical biopsy according to the instruction by colposcopists who evaluated cervicography sent from private clinics. The pathologic data performed at private clinics were collected using telephone or e-mail by authors. The following parameters were recorded and included in the analysis: age, diagnosis based on digital cervicography, cervical cytology, HPV DNA test and cervical pathology. Cervicography is a photographic method invented by Stafl in 1981. A cerviscope is a diagnostic device that utilizes the principle of colposcopy. It is composed of a 35-mm camera and fixed 100-mm macrolens. The cervix is visualized with a vaginal speculum and 5% acetic acid is applied to the cervix. The image of the acetic-acid treated cervix is processed onto film and projected on a white screen for analysis [10, 11]. We have used digital cervicography since 2010 and collected the data from private clinics. The cervicography image was interpreted by expert colposcopists, all of whom were professors at hospitals associated with medical colleges in Korea and had considerable experience in colposcopy. The colposcopist's interpretation of the cervicography was returned to the private clinic and cervical biopsy was performed on patient whose cervicography result was deemed abnormal (Fig. 1). The digital cervicography results in which the transformation zone could not be evaluated was considered unsatisfactory. Women with unsatisfactory or normal finding of cervicography were excluded from the study. Abnormal interpretation categories of cervicography were defined as follows: “atypical” if an acetowhite area was found outside the transformation zone or acetowhite area showed unclear or insignificant features due to mucus or blood within the transformation zone; “compatible with cancer” if comparable to cervical cancer; and “comparable with CIN” if suggestive of cervical intraepithelial neoplasia (CIN). “Compatible with CIN” findings were again subcategorized into 2 degrees: “compatible with CIN 1” if suggestive of CIN 1 and “compatible with CIN 2/3” if indicative of CIN 2 or CIN 3. The exact agreement was defined as follows: if “atypical” on cervicogram was indicative of CIN or cancer; if “compatible with CIN1”, “compatible with CIN2/3”, and “compatible with cancer” in cervicography impression corresponded to CIN1, CIN2 or CIN 3, and cancer, respectively in pathology. Data analysis was conducted with statistical software, SAS version 8.0 (SAS institute Inc, USA). The analysis of variance (ANOVA) was utilized to evaluate the difference of age according to the cervicography interpretations. Kappa value was used to know the agreement trend between cervicography impression and cervical pathology. A total of 1547 patients had digital cervicography, Pap smear, and cervical pathology. The histology results from this population showed 74.2% CIN, 13.9% cervical cancer, and 11.9% cervicitis (Table 1). Table 1 shows the distribution of cervicography interpretation according to the cervical pathology. The most prevalent interpretation of cervicography was atypical (n = 834, 53.9%) followed by “compatible with CIN 1” (n = 358, 23.1%). With regard to the distribution of cervical cytology, there were 568 women (36.7%) who presented with high-grade squamous intraepithelial lesion (HSIL) cytology and 520 women (33.6%) who presented with atypical cytology. The age range of 1547 women was 14-91 years, with a mean of 37.4 years. The mean age of women with “compatible with cancer” was 56.5 years, which was older than any of the other groups (P < 0.01, ANOVA) (Table 2). The association between abnormal findings of cervicography and cervical biopsy is shown in Table 3. The rate of exact agreement between abnormal cervicography and cervical pathology were 52.0% in “compatible with CIN 1”, 78.9% in “compatible with CIN 2/3”, and 90.2% in those with “compatible with cancer”. The statistical significance of accordance between “compatible with CIN” cervicography and cervical pathology was noted (kappa: 0.258, P < 0.01). Of 581 women with “compatible with CIN”, 35 (13.7%) women had lower grade pathology than cervicography and 184 (31.7%) women had histology that exhibited higher grade pathology than cervicography. This analysis shows a remarkably high concordance between abnormal findings of digital cervicography and cervical pathology. The overall concordance rate of abnormal cervicography interpretations (N = 1547) with cervical pathology was 74.4%. Surprisingly, the rate of exact agreement between “compatible with CIN and cancer” cervicography (n = 713) with cervical pathology is 67.5%. In addition, the agreement rate increased up to 95.1% within permissible limits of one degree of difference. Cervicography was used to resolve the low sensitivity of the Pap smear, and improved the sensitivity of cervical cytology to 77% . The merit of cervicography at private clinics in Korea is its relatively low cost of $25-40 compared with $100 for a HPV DNA test. Also, the cost of a cervicoscope is less than that of a colposcope. It enables doctors to easily set up a cervicography screening system and move away from time-consuming procedures like colposcopy. The technique of cervicography is easy to perform, and also provides legal evidence and a photograph of the cervix with an explanation of the result by an authorized colposcopist. Unfortunately, the high false positivity of cervicography is a diagnostic limitation of this method . Acetowhite epithelium is the transformation zone where the tissue color changes to white after application of acetic acid. It can also be seen occasionally in squamous metaplasia during the healing stage , and carelessly confused with leukoplakia of the cervix . Moreover, bleeding and mucus are factors that can confuse the interpretation of cervicography. Tawa et al reported that 95% of women without dysplasia were incorrectly diagnosed with use of cervicography. After application of acetic acid, these authors categorized any visible white lesion as suspicious, resulting in a very high false positive rate, and referred the patient for colposcopy . The diagnostic categories in this study, which were modified from the original report by Stafl , were negative, atypical, compatible with CIN 1, compatible with CIN 2/3, and compatible with cancer. The criteria for assigning the sample to the suspicious atypical group was used in our study, but the false positive rate could not be determined because of the limitations of the study design. Our results show that agreement rates between “compatible with CIN and cancer” on cervicography and pathology in CIN 1, CIN2 or 3, and cervical cancer were 52.0%, 78.9%, and 90.2%, respectively. These results are similar to published reports evaluating the accuracy of cervicography results [17, 18]. Our results of cervicography show a proportional trend with cervical pathology, and the highest accordance is achieved with cervical cancer (kappa value: 0.258, P < 0.01). The increasing tendency for agreement to occur with the increasing severity of the cervical pathology is also noted with colposcopy [19, 20]. Interestingly, the positive predictive value of “compatible with CIN 2/3 or cancer” cervicography result is better than for 39% of colposcopy for CIN 2/3 or cancer . In colposcopic evaluation, the Reid colposcopic index showed a low sensitivity of 37.3% in the diagnosis of CIN3 . Only 57% of CIN2-3 was detected on the biopsy that was performed on the most abnormal area in colposcopy . Based on our results of HPV types, HPV 16, 11, 58, 6, 52, 31 and 33 were the most common types in the HPV positive patients (475 cases) and the proportion of those were as follows: 34.7%, 8.8%, 8.6%, 7.8%, 6.9%, 6.9% and 6.7%. In our study, digital cervicography results were more frequently underestimated than overestimated, suggesting a tendency not to detect higher grade lesions. Of 358 women with “compatible with CIN 1” results, 160 (44.7%) were diagnosed with CIN2/3 and cancer. Surprisingly, 66 (41.3%) of the 160 women had atypical cytology or low grade squamous intraepithelial lesion (LSIL). These results suggest that the interpretation of the results should be cautious, even when low grade abnormalities are found with cervicography and cervical cytology. A limitation of this study is that the biopsies were not all performed at one institution, which could cause error due to diagnostic bias. The study population was limited to women with abnormal cervicography, which makes it difficult to assess the true disease status and could cause verification bias in evaluating the diagnostic device [23, 24]. In conclusion, our results emphasize the high concordance rate of digital cervicography in outpatient clinics in Korea. This study suggests that the lack of availability of expert colposcopists can be safely substituted by cervicography. Cervicography can be a good indicator of the need for a cervical biopsy, and is an excellent auxiliary tool for pre-invasive disease and cervical cancer.